Mark Chierego’s mod features a single layer headbasket, point to point solid core wiring, Australian made ribbons (1.8 micron 99.9% pure aluminium), matched with either a Samar Audio Design toroidal transformers or the Lundahl 2912. Fat Head II Product Desc. The II is not offered with a Cinemag transformer. The II has a larger body and a polished nickel grille. Both models include a plastic shockmount, but the two shockmounts differ. with a brown body and gold grille, or with a silver body and polished nickel grille, or with a black body and polished nickel grille. The Fat Head II is appropriately named: it provides a warm, plump sound, with a smooth rolloff starting around 8 kHz that finishes around 15 kHz. In addition, the mic seems to thicken the upper bass frequencies, a coloration I often found myself EQ’ing out after the fact. An important point to remember about directional mics … is that they are prone to the proximity effect… The combination of the Fat Head II’s dark tonality and strong proximity effect can be a double whammy. Unless you’re looking for a superfat sound, I’d avoid using a Fat Head II for extreme close-miking applications. Against the Royer R-121, The Fat Head was big and smooth sounding with an articulate midrange and clear top that sounded really close to the amp in the room. The Royer sounded leaner with a mid boost somewhere between 1.5 and 3k — sounding more present but not quite as ballsy as the the Fat Head in the low end… the only application that we liked the Royer better was on the clean sounds because the mid boost on the mic brought out a nice shimmer to the sound. Next up was the AEA R-84 and here the difference was the low end… The sound vs. the Fat Head had more girth in the mid low (increased distance from the speaker would have fixed this I suspect) making for a slightly congested lower-midrange… I started using the console eq on my Ghost to see if I could get the Fat Head to sound like the others. Lo and behold with some minor tweaks here and there they sounded so close that no one in the control room could tell them apart! The Cascade Fat Head II (w/Lundahl upgrade) was part of our $60,000 Ribbon mic shootout. 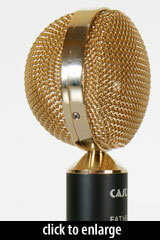 The Cascade Microphones Fat Head II is also known as: Fathead II. The mic was released in 2007. Frequency Response - BidirectionalClick Graph to Compare!